1. Preheat the oven to 170˚C, gas mark 3. Grease the base and sides of a 23cm springform cake tin and line with baking parchment. Sift together all the dry ingredients except the sugar; set aside. Using electric beaters, cream the butter and sugar for 1 minute. Add the eggs, 1 at a time, beating after each addition, then beat in the vanilla. Beat in ¼ the dry ingredients, then 1/3 the buttermilk and repeat, until fully combined. Mix the vinegar and food colouring together; beat into the mixture. Scrape into the tin and spread until level; tap the tin on the work surface to knock out any air bubbles. Bake for 1 hour or until a skewer inserted into the centre comes out clean. Set on a wire rack and leave to cool completely in the tin. 2. For the filling, use electric beaters to beat together the butter, soft cheese and icing sugar. Remove the cake from the tin and cut horizontally into 3 even layers (use a serrated knife). Take the bottom layer and place on a baking sheet, spread with ½ the filling, then repeat with the middle layer of cake and remainder of the filling; top with the final layer of cake. Leave to set in the fridge for 20-30 minutes. 3. For the icing, melt the cream, chocolate and glucose together in a heatproof bowl set over a pan of barely simmering water (making sure the base of the bowl doesn’t touch the water). Melt the white chocolate in another bowl using the same method and pour into a small piping bag. 4. Invert the cake onto a wire rack so there is a flat surface for the icing; set over a tray to catch the drips. Working quickly, pour the dark chocolate icing over the middle of the cake. With a palette knife, use long strokes to push the icing over the sides to create an even coating over the whole cake. 5. Starting slightly off centre, pipe a white chocolate spiral from the centre of the cake out to the edges (the tighter the lines, the more dramatic the effect). Take a cocktail stick and, starting from the centre, pull it through the white chocolate to the outside. 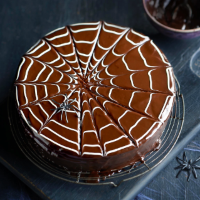 Repeat, working around the cake, to create a spider’s web effect (see our Food Editor’s Top 5 page for more tips). Let the icing set for about 20-30 minutes. To store, keep refrigerated, and bring to room temperature before eating.